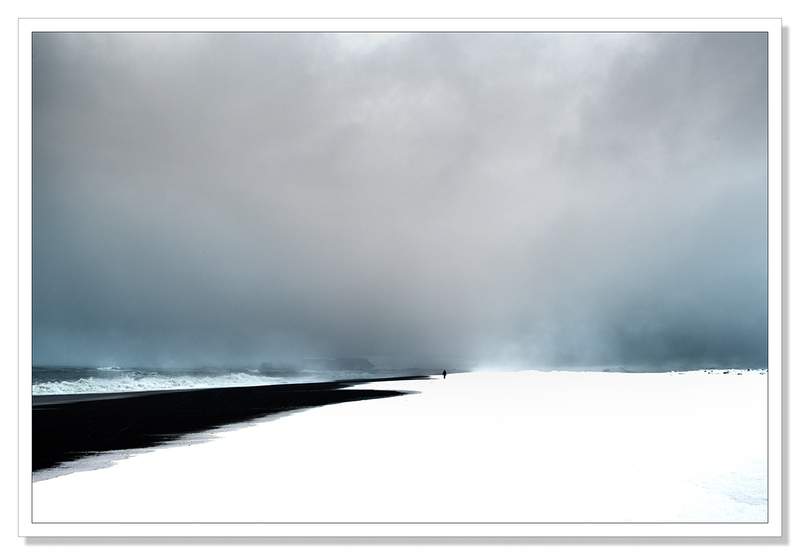 I was on the beach at Reynisfjara at the very southern-most tip of Iceland in a blizzard back in February. I was taking pictures despite the snow when a figure seemed to materialise out of nowhere, way up the beach, walking towards me. As he came close I saw that he was a fellow photographer. As he passed we exchanged greetings, surreptitiously checking out each other’s equipment (like you do) while we talked. Satisfied and content in that camera brand camaraderie one finds amongst Nikon and Canon shooters alike, we said goodbye and he moved off. A piece of music came unbidden to mind, a lovely piece of music by the great Joe Harnell, The lonely Man. The piece of music, one I used to play myself, accompanied the closing credits to the Incredible Hulk TV series as David Bannerman, still afflicted by the hulk curse after another adventure, set off once more in his lonely search for a cure. This is a link to the music if you’re unfamiliar with it. It was used in the recent Hulk movie too – https://www.youtube.com/watch?v=U4_5c1OJXc4 It just seemed to just fit the image somehow.. Enjoy! This entry was posted on August 27, 2015 by Chillbrook. It was filed under Photography, Photography and Travel and was tagged with Adrian Theze, Beach, Blizzard, Cornwall Photographic, Iceland, Joe Harnell, Landscape Photography, Nikon D800e, Photography, Reynisfjara, Seascape, Snow, The Lonely Man. Thank you very much. 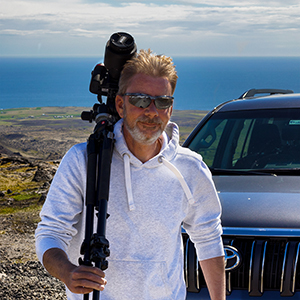 Iceland is a wonderful place to visit. I can heartily recommend it! This shot is absolutely MAGNIFICENT! Those moments when you’re glad to have a camera in hand. I can see that on a book cover by the same name, Adrian…so very beautiful…stunning, actually. Great image and a wonderful piece of music to match. Almost haunting, a wonderful image,thank you. I too was going to say my first impression was …looks like an awesome surreal painting. A fantastic work of “art”. It must be bliss to work surrounded by such vast solitude…but no doubt much preparation in the making. Wonderful, dramatic shot! That’s a great story to go with it too – so special when a photo can conjure up a moment that may have been forgotte. Great image! …. I see you’ve had a problem on Twitter. Which is your correct @name now? Hello Rhys, thank you.. Yes, issues with Twitter claiming I deleted my account and somehow all my work was suddenly being attributed to this new “Chillbrook”. Twitter are not helping resolve the issue other than to say I’m welcome to open a new account, which I’ve done but I think my twitter days are over to be honest. They can’t admit to a computer glitch allowing someone else to register with my username, locking me out of the account and as with all these social media companies, they won’t engage in dialogue so there’s nothing I can do. Thank you Frank, much appreciated as always! Fabulous image, full of moody, brooding atmosphere. It would make a great book cover or film poster for a Cold War spy thriller…….and it looks like a still image from the set of Fortitude. Thank you Mark! I’ll submit it to my agency. I don’t think I was partiucularly surprised it was another photographer. Only photographers would be mad enough to be out on the beach in these conditions. First of all….Love the picture of YOU! Second love the picture you’ve posted. I don’t think it would have the same impact without the man. The vastness and emptiness of the space is consuming. The mystery, the vast solitude-fantastic! Wow, so cool – perfect framing leaving us with a great sense of solitude…which is very comforting. Thank you Randall. The beach scene was so vast I was worried about being able to capture the mood, the space and then this lone figure appeared out of the snow and I knew I now had a shot worth taking. Wow – an iconic capture, Adrian. Just wonderful. Every little detail of this image is wonderful. I like your music choice too!